Where I Got It: An publisher from Bascom Hill Books contacted The Broke and the Bookish asking one of us to read the book, so they sent it to me! Why I Read It: It sounded very interested to read! This is a book written by an leg amputee who went almost his entire life with one leg after a bone cancer called, Osteosarcroma developed in his knee when he was 16 years old, and the doctors could not save his leg below his knee. In this book he talks about the trials, tribulations, and obstacles he went through while growing up without one leg and being good despite that. He also ended up developing cancer in his lungs where 2/5 of it have to be removed. Considering what this guy went through for 35 years now, it's a sad, but happy story. I just couldn't REALLY get into it because I felt like the entire story just dragged on and there was quite a bit of information, and detail that could have been left out of the story. It was dry, and rather boring. 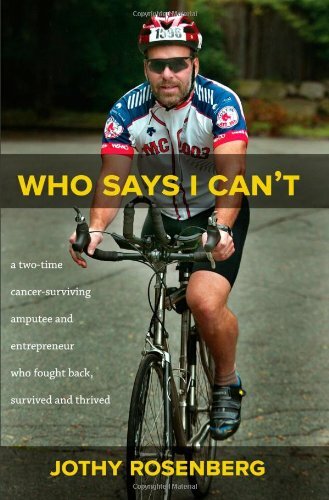 However, reading about some of the accomplishments that this 35 year cancer surviving amputee makes you realize that if you put your mind to it, you can do just about anything. Jothy was able to participate in skiing in Michigan and in Quebec, Canada, went water boarding/skiing, played in beach volleyball matches, and even participated in a triatholan. Keep in mind, he did all of this with only ONE leg to work with. Jothy's story is a heartbreaking one, and a happy one, all in the same book. I do wish that the way it was written, was a lot better so I could enjoy the book better. But it just didn't cut it for me and took all of the strength that I could to finish reading it. I wanted to give this book more than 2 stars, I really did, but I just couldn't stand to give it even one sympathy star. I know that sounds horrible, but it just wasn't an interesting read. It consisted of too much data, too many quotes from other people that didn't pertain to the story, and the book could have been written better with less events happening constantly. It was hard to follow, and kind of a dry read. Even giving it two stars, is pushing it. I apologize, but as bad as I feel this poor man went through all that he did, I just don't recommend this to be added to anyone's to be read lists. I hate when I read a book about someone's life that is sad story or a horrible event but I have to give it a bad review or rating because the writing was horrible or something like that. I just always feel bad! I think you did a good job reviewing it despite how hard it was to get through it! I won't be adding this to my tbr list! Stephany, I had to read a badly-written book also and just wrote the review for it tonight. I could not even finish it, though, so I'm glad you pushed through this one. It can be SO hard! At least you were honest, though. :) We have no credibility here and TB&TB, though, if we don't honestly express our opinions! I agree! We are asked our honest opinions when we read books, so I guess if someone doesn't enjoy our review, then I don't know what to say! Thanks for your feedback Jana! In Which Snickers Tackles the B&B Industry. 200 Followers in 2 Months Giveaway!! Natanya's Ramblings on "The Red Tent"